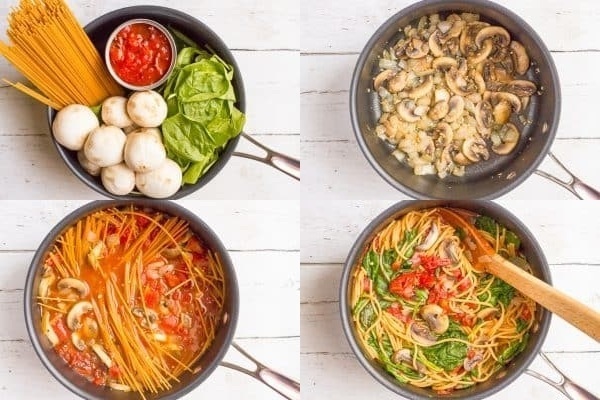 There is nothing easier than cooking vegetarian pasta and this is not necessarily just spaghetti with tomato sauce. 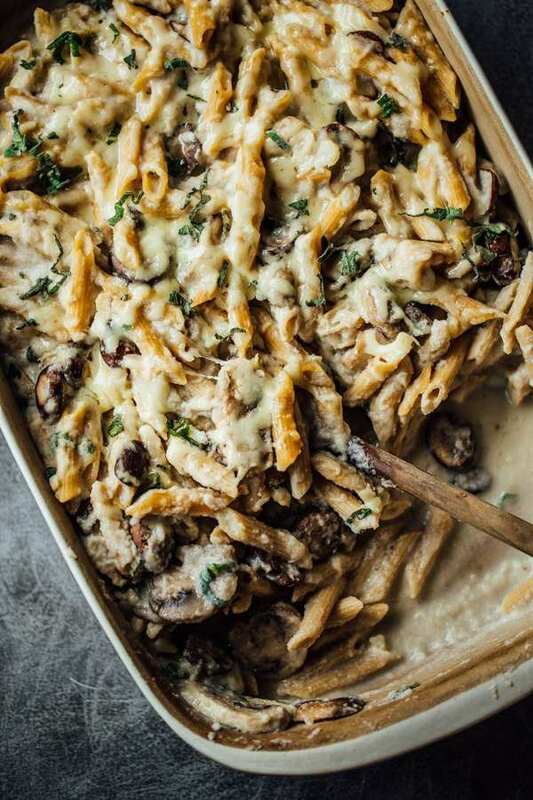 Pasta is perfectly combined with almost any variety of greens and eggplants, sweet and hot peppers, zucchini and pumpkin, mushrooms and broccoli, cauliflower, etc. The word “pasta” in Italian means “dough” and it is made from wheat. Fresh pasta needs only a few minutes to be cooked while dry varieties take a little more time. 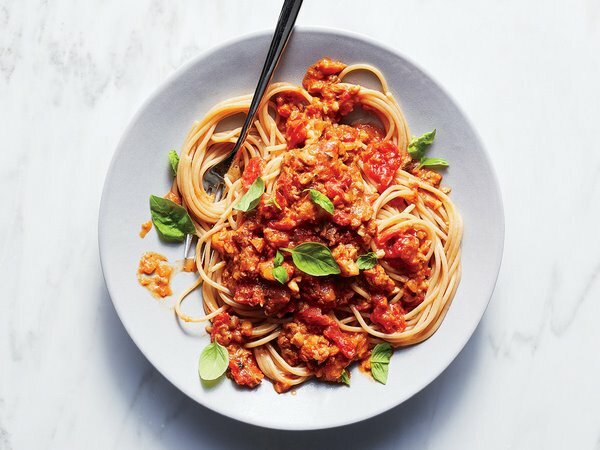 By all means do not overcook your pasta, you should boil it until al dente and then add it to the sauce where it will get all the taste and flavors. 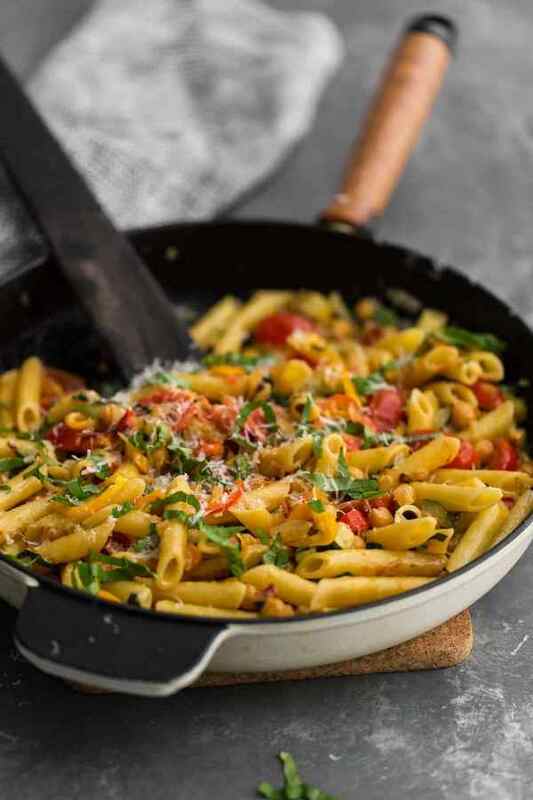 Vegetarian pasta recipes – be creative in the kitchen! 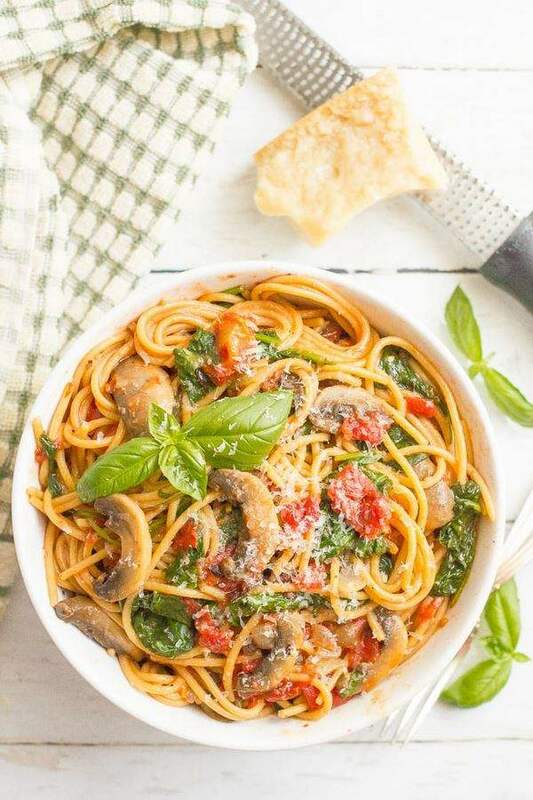 The great advantage of Italian cuisine is that it offers numerous recipes and vegetarian pasta sauces are not less than the ones with meat, fish or seafood. 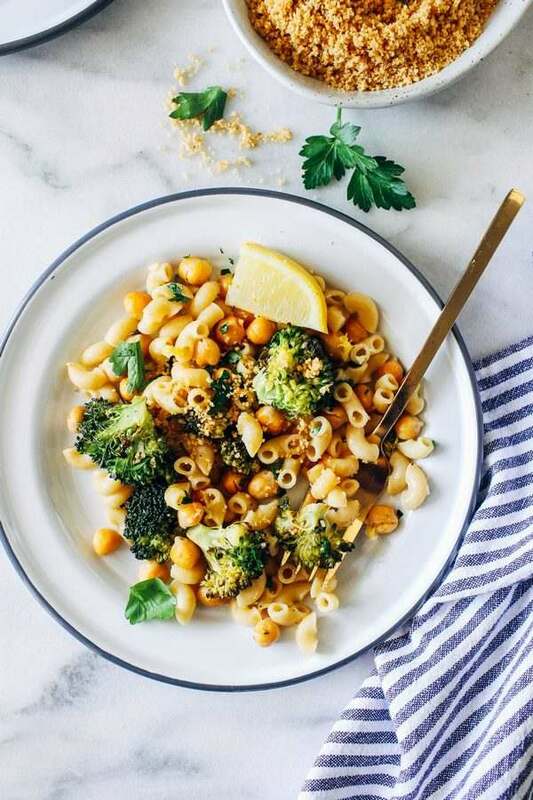 You can experiment with your favorite ingredients and prepare vegetarian pasta with green peas, chickpeas, lentils, corn, etc. 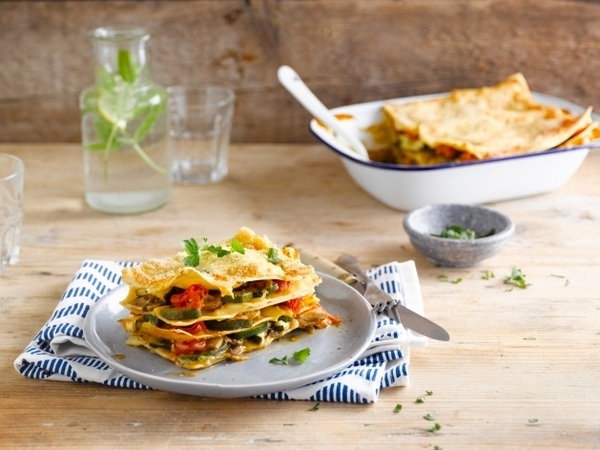 A vegetarian lasagna, for example, can be prepared with eggplant or zucchini, tortellini and ravioli can be stuffed with spinach, pumpkin, ricotta or mushrooms. Do not forget to add a final touch with grated cheese! Remember that cheese can be replaced with chopped nuts or bread crumbs fried with garlic and parsley. 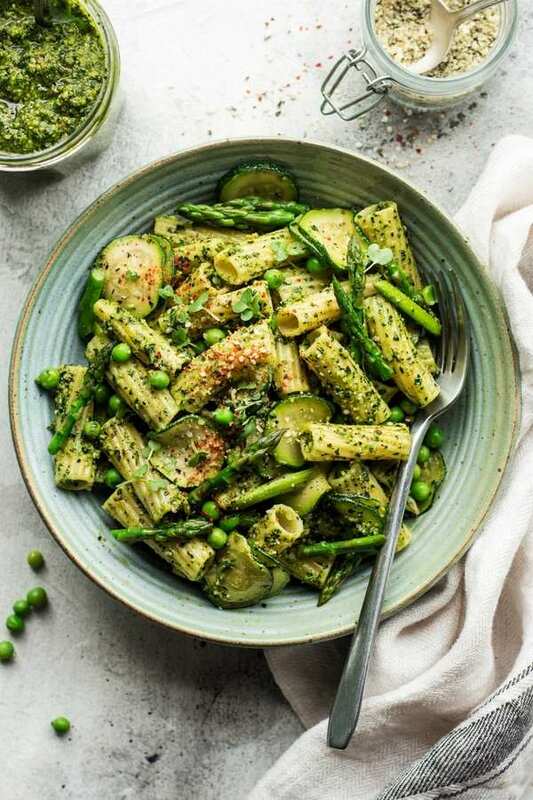 Vegetarian pasta will always be an excellent choice as a main course and we offer you a selection of quick and delicious recipes which you can prepare for your family and friends. Combine chickpeas, 1/2 cup of the Parmesan cheese, the bread crumbs, garlic and basil in the bowl of a food processor. Process 1 minute to combine.55 Add the egg and salt to taste. Process until the mixture is completely blended. Refrigerate for 20 minutes. Heat the oven to 400F (200C). Spray a baking tray with cooking spray. Scoop from the chickpea mixture and gently roll into a ball. Repeat with remaining mixture to form about 16-18 balls. Heat oil over medium heat in a skillet. Add chickpea balls and cook for 5 to 6 minutes, turning frequently, until lightly brown on all sides. Transfer to baking tray. Bake for 7 – 8 minutes or until balls are firm to the touch. Heat the sauce in a covered saucepan over medium-low heat, stirring occasionally, until heated through. Cook pasta following package directions. 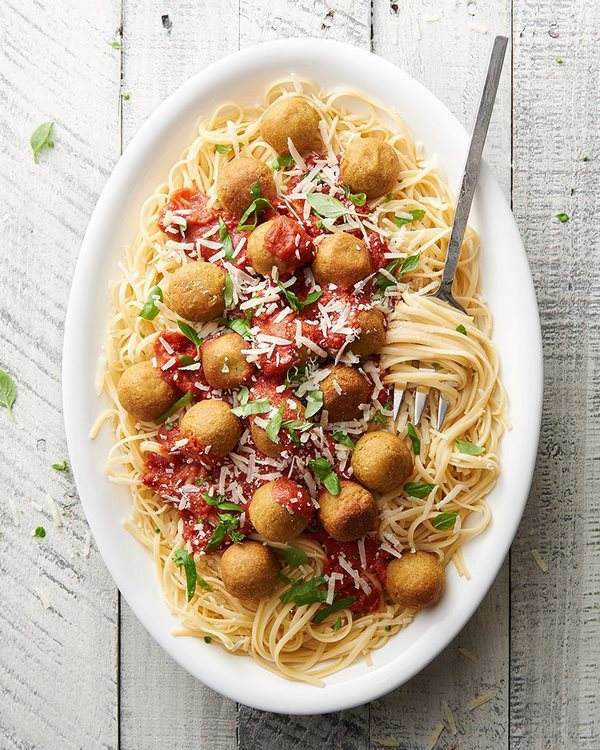 Arrange the chickpea meatballs over cooked pasta and sauce and sprinkle the remaining Parmesan cheese. Heat olive oil in a pot over medium heat. Add onion and mushrooms and cook for 5-7 minutes, until tender. Add garlic and season with salt, pepper and red pepper flakes (if using) and cook for 30 seconds. Increase heat to high and add the tomatoes and broth. Bring to a boil. Add spaghetti and stir until they wilt and fit in the pot. Cover the pot, reduce the heat to medium-low and cook for 5 minutes. Add fresh spinach, stirring to get the spinach mixed in and wilted. Remove from heat and let spaghetti sit, covered with the lid, for a few minutes. Add Parmesan cheese, stir and taste. Adjust seasonings, if needed. 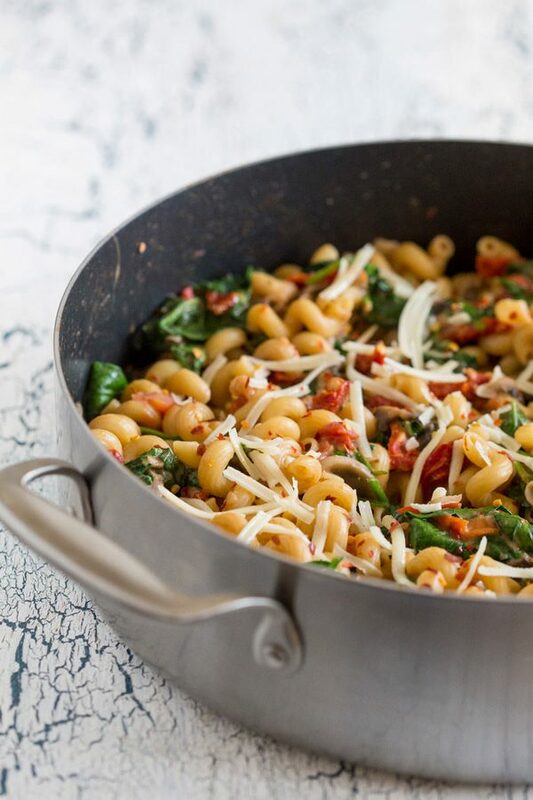 Serve with fresh basil and extra Parmesan cheese. Bring a large pot of water to a boil. Add 1 tablespoon salt and cook the pasta until al dente. Drain, reserving 1/2 cup of the pasta water. While pasta cooks, chop the garlic, halve the cherry tomatoes, drain and chop the artichokes and slice the olives in half. Heat the olive oil in a large skillet over medium high heat. Add the tomatoes, garlic and season with salt, black pepper and crushed red pepper flakes. Cook, stirring frequently, for 3-4 minutes. Add the drained pasta to the skillet and toss to combine. Add the artichokes and olives. Drizzle the lemon juice. Cook for another 1 to 2 minutes and add a splash of the reserved pasta water, if needed. Remove from heat and sprinkle with Parmesan and parsley. Bring a large pot of water to a boil. Add 1 tablespoon salt and cook the pasta according to package instructions. Drain, reserving 1/2 cup of the pasta water. 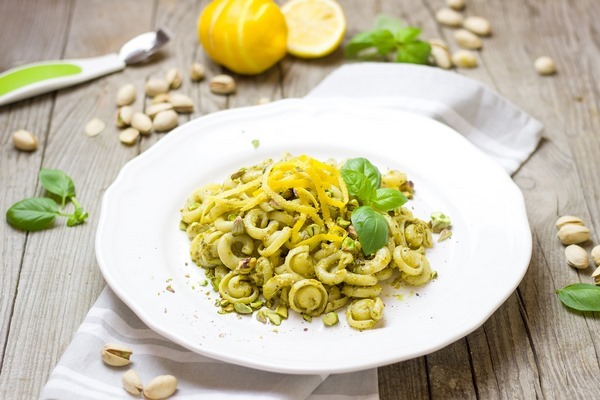 Place spinach, basil, pine nuts, garlic, Parmesan, 1/4 cup olive oil and avocado in a food processor. Process until pesto is smooth and season it with salt and pepper to taste. Brush the corn with 1 teaspoon olive oil and grill over medium-high heat, turning occasionally, until corn is slightly charred. Cut the corn off the cobs. 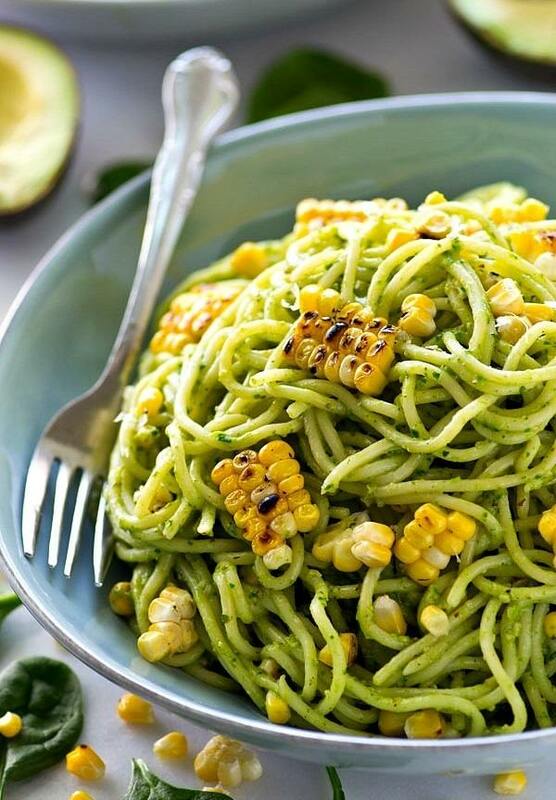 Toss hot pasta with pesto and grilled corn. Add a splash of the reserved water, if needed. Taste and adjust seasoning, if needed. 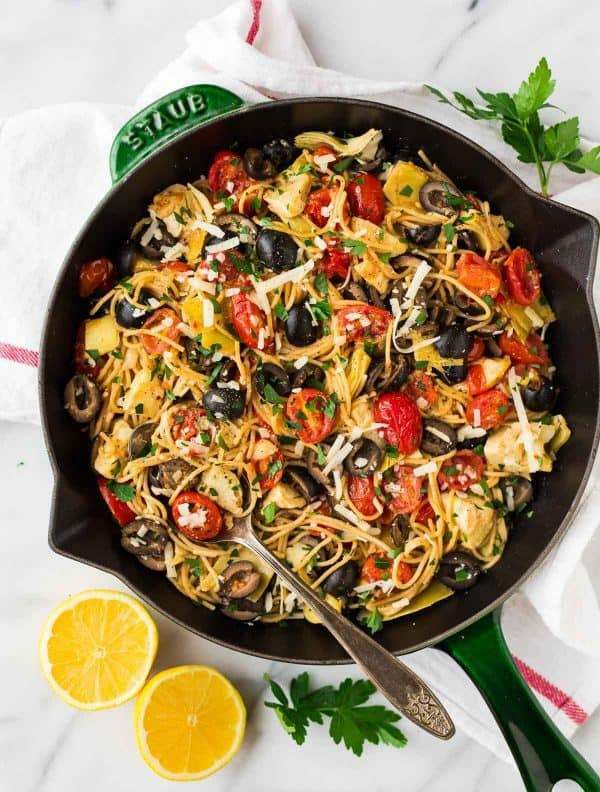 In a large skillet, heat the olive oil over medium-high heat. Add the shallot, asparagus, artichoke, spinach, garlic, and frozen peas. Cook for about 5 minutes until vegetables are tender. 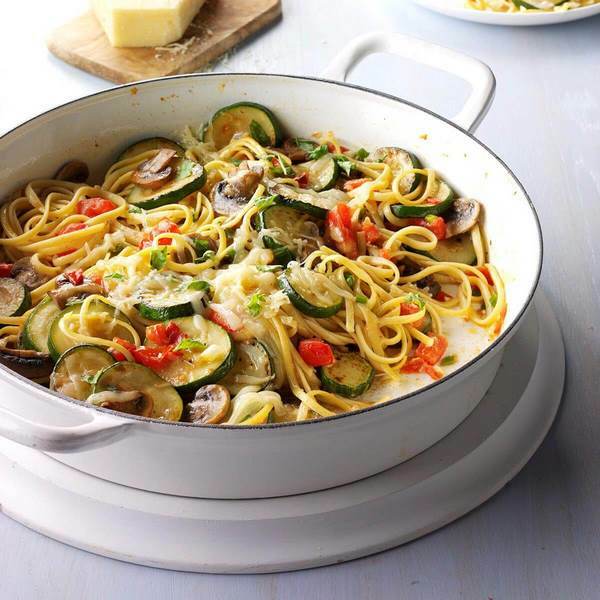 Remove the vegetables from the skillet into a large bowl and set aside. Bring a large pot of water to a boil and add 1 tablespoon salt. Cook pasta according to package instructions. 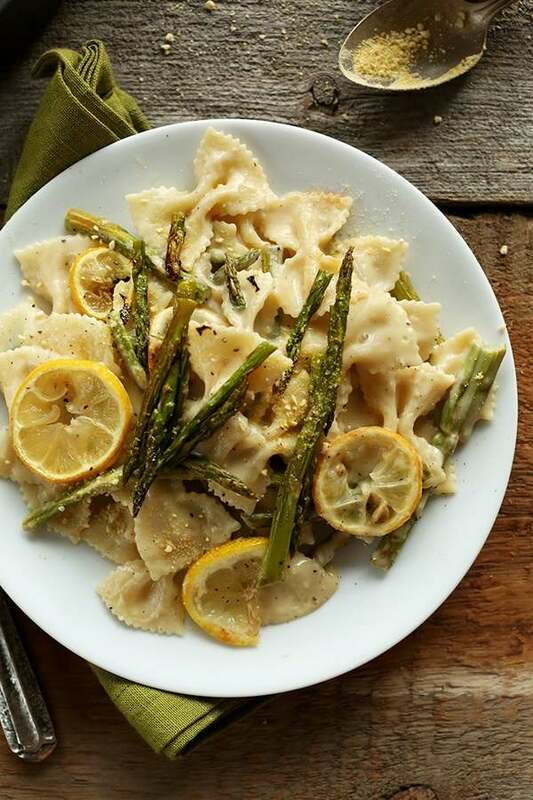 While pasta is cooking, make the creamy lemon sauce. Melt the butter in the skillet. Whisk in the flour. Slowly whisk in the almond milk. Add the lemon zest and keep whisking until the sauce comes to a boil. Reduce heat to low and cook until the sauce thickens. Add the lemon juice and sliced lemons. Season with salt and black pepper, to taste. Drain the pasta and add it to the thickened lemon sauce. Stir in the cooked vegetables. Remove the lemon slices. 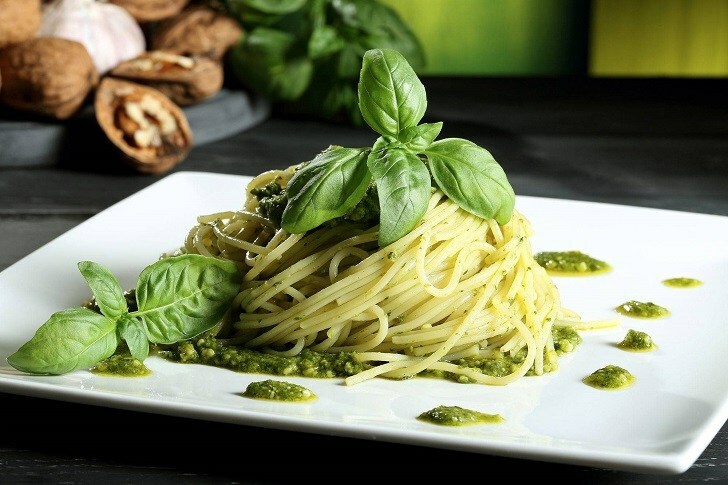 Garnish with fresh basil and Parmesan cheese. Serve warm. Preheat oven to 400°F (200C). Rinse the chickpeas, pat dry and place them with the broccoli to a baking sheet. Drizzle with oil, half of the lemon juice and season with salt and pepper. Roast in the oven for 15-20 minutes, until golden brown. Meanwhile, bring a large pot of water to a boil and add 1 tablespoon salt. Cook pasta according to package instructions. In a large skillet, warm the olive oil over medium-low heat. Add the garlic and cook for about 1 minute. 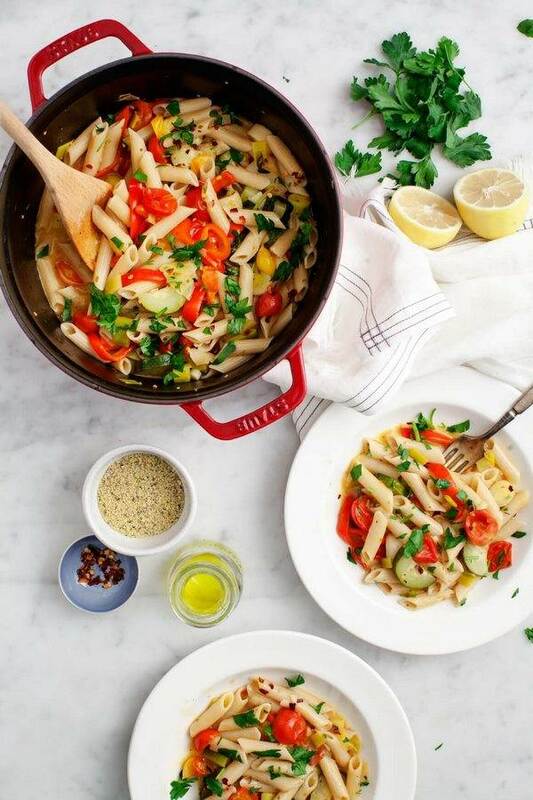 Drain the pasta and add it to the skillet with remaining lemon juice and lemon zest. Add the roasted broccoli and chickpeas to the skillet and toss to combine. 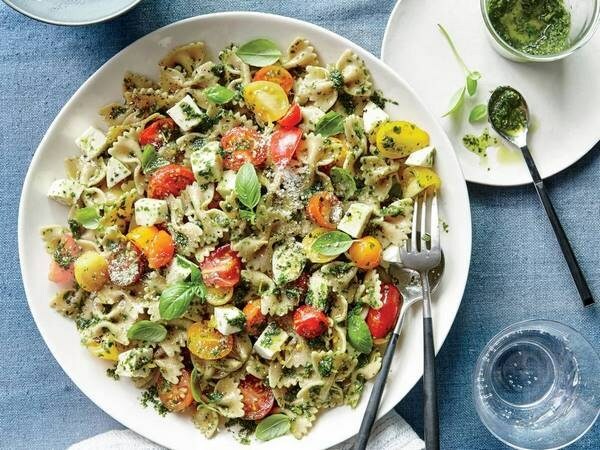 Divide pasta into bowls, sprinkle with Parmesan cheese and fresh parsley. Toast the pine nuts over medium heat in a large skillet until golden and fragrant. Remove to a plate and set aside. Bring a large pot of water to a boil and add 1 tablespoon salt. Cook pasta until al dente. Drain and return to the pot. Drizzle with olive oil and stir to prevent sticking. Combine garlic and 1/3 cup of parsley, oregano and thyme in a food processor or blender. Process until finely chopped. Add 1 cup of peas, the ricotta cheese, lemon zest and juice, 1/4 cup olive oil. Pulse until ingredients combine. Season with salt and black pepper. Add the ricotta mixture to the pasta and stir it up. 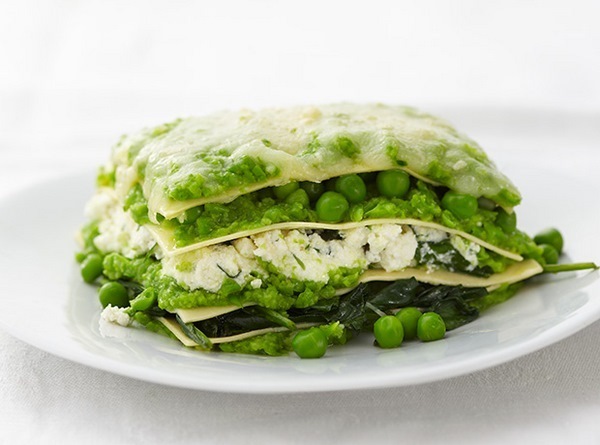 Add the remaining ½ cup of peas, 1/2 cup grated Parmesan and a drizzle of olive oil. Toss to combine. 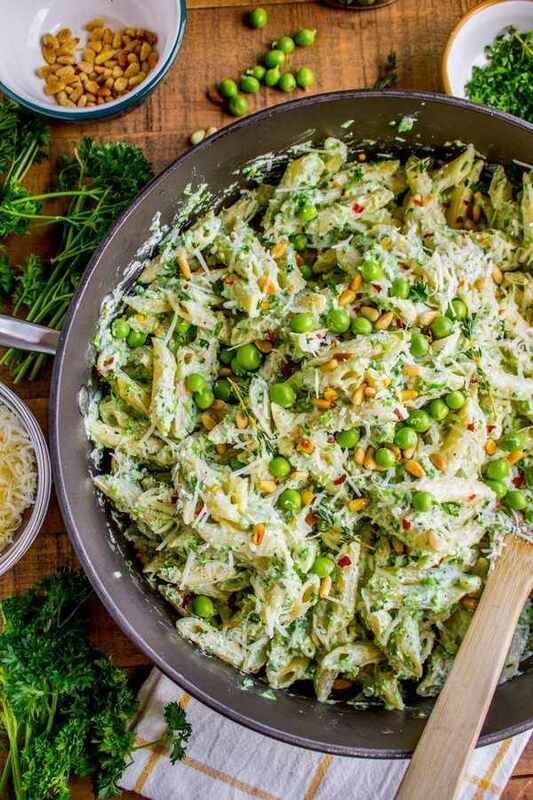 Divide pasta into plates, top with pine nuts sprinkle with Parmesan cheese and serve. Bring a large pot of water to boil and cook the pasta for 5 minutes. Drain, drizzle with olive oil and set aside. Bring a large pot of water to a boil, add the cauliflower and cook for 5 minutes. Melt a tablespoon of butter, add the minced garlic and cook for 1 minute. Place the cooked cauliflower, 2 cups of broth, milk, oil, salt, and the garlic into a blender. Process until smooth. Preheat the oven to 400F (200C). Heat 3 tablespoons butter in a large skillet. Add the mushrooms and cook until golden brown. 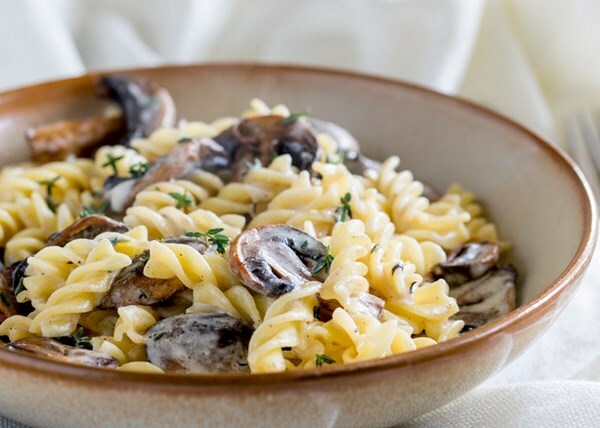 Combine the cooked pasta, cauliflower sauce, and mushrooms together. Add the remaining cup of broth. Transfer to a deep baking dish. Sprinkle with cheese and bake uncovered for 10-15 minutes. 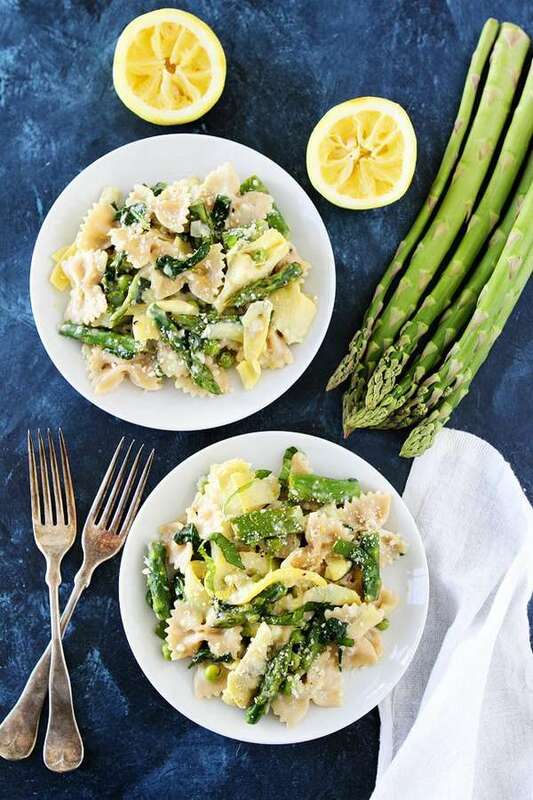 The post Easy and delicious vegetarian pasta recipes for lunch and dinner appeared first on Deavita Interior design and Architecture Magazine.